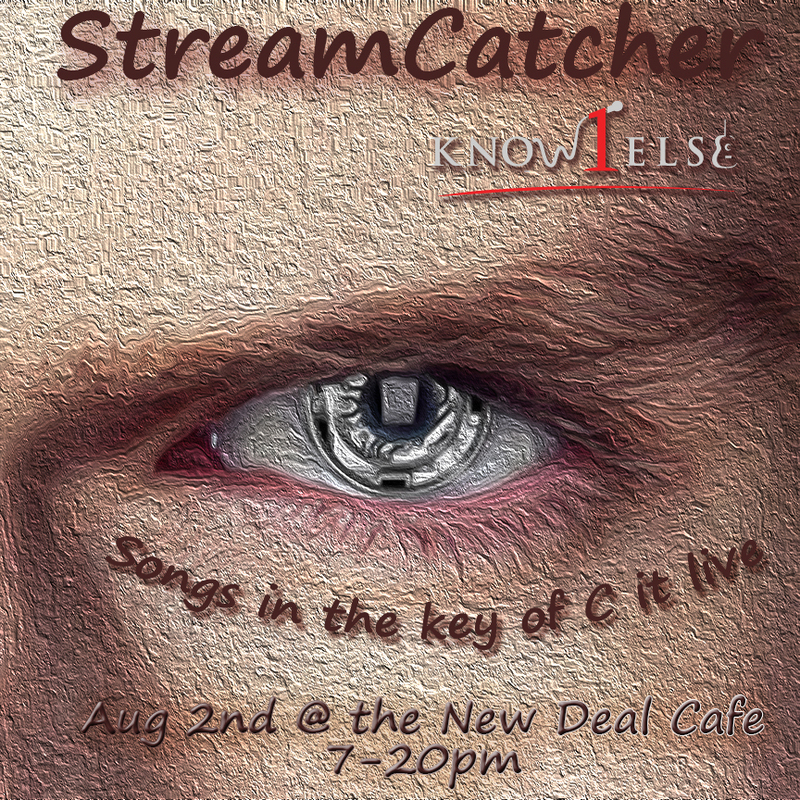 Wanna hear new and original music!? Please join me for a new music event at Outta the Way Cafe. 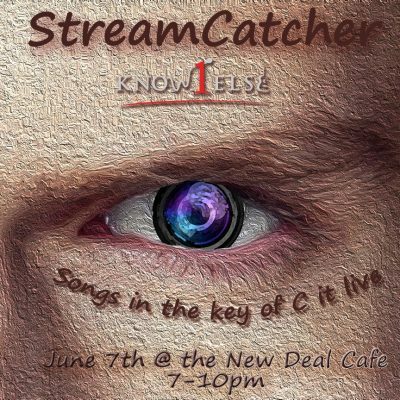 I'm hosting a Singer/Songwriter showcase every first Thursday of the month. 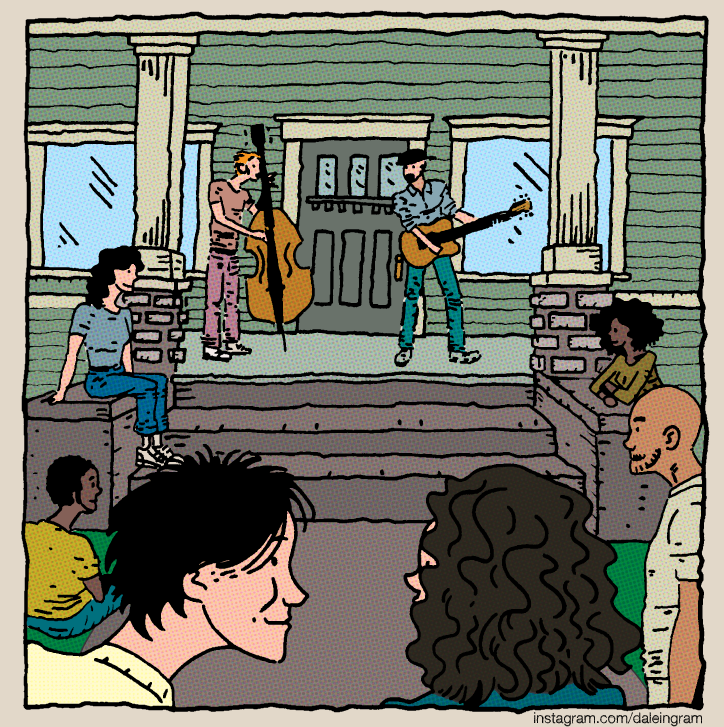 You get to hear the stories behind the songs in a fun round robin style format. 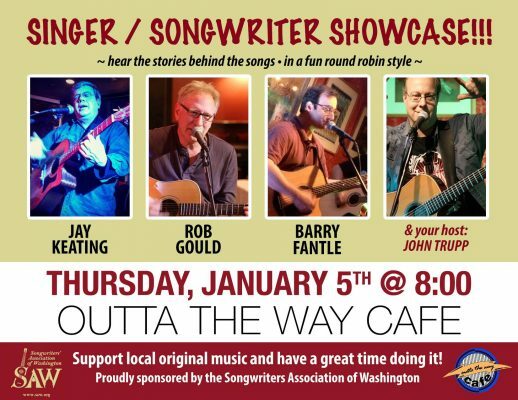 This is event is proudly sponsored by the Songwriters Association of Washington. There will probably be surprise guests, as well! It's gonna be huge fun. You do not want to miss this. 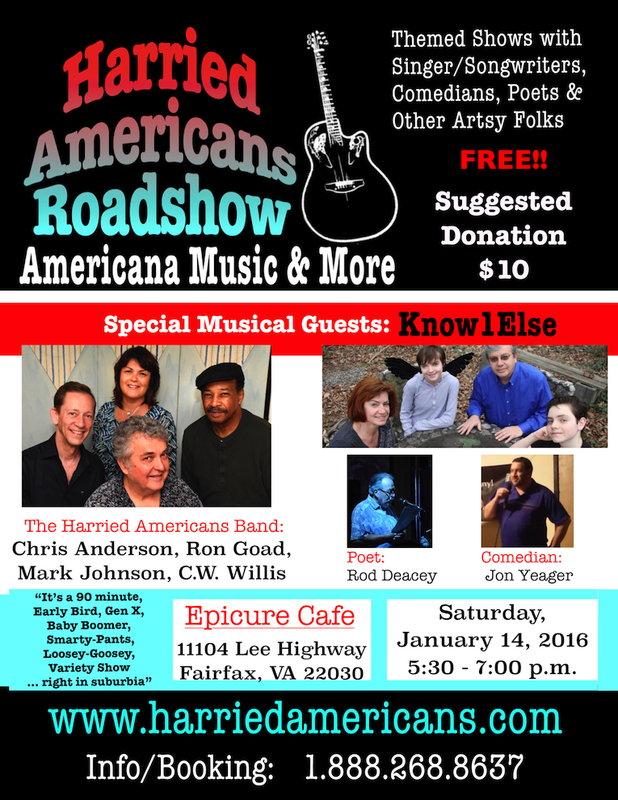 The Harried Americans are musicians based in the Washington, DC metro area presenting live Americana, Roots & Original Contemporary Folk music. 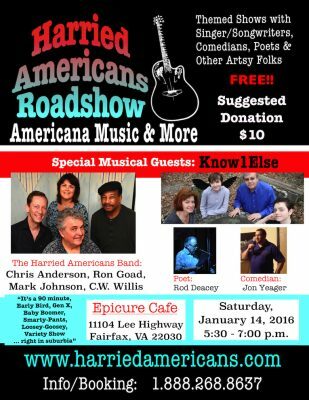 The monthly second Saturday Harried Americans Roadshow (at the Epicure Cafe in Fairfax, Virginia) includes guest artists, comedians and poets – with a DC area twist – original songs and wisecracks about politics and current events. 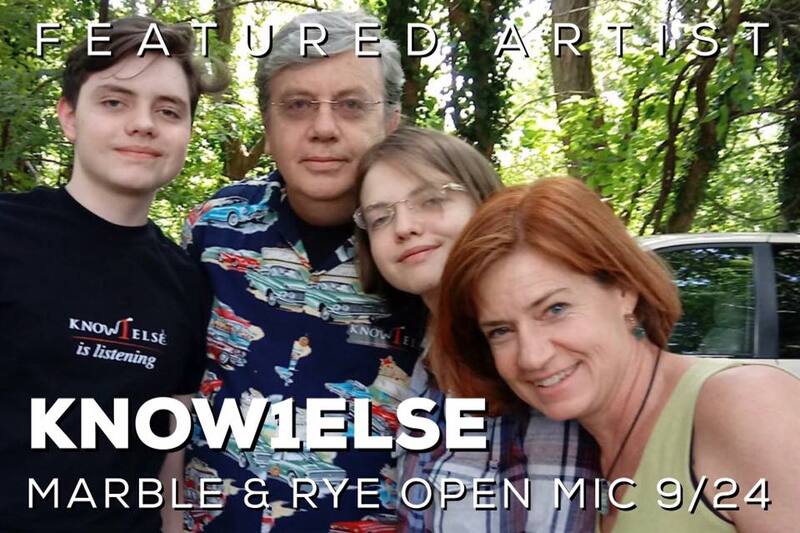 2:00 pm Asbury Methodist Village, Gaithersburg Know1Else performs for Asbury Village's Music at the Blue Note as part of SAW Serves. 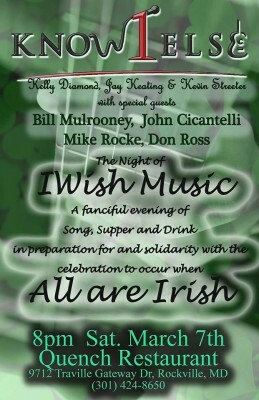 Focus Music is bringing a day of Celtic themed music to Alexandria, Saturday, May 13th With renowned Celtic artists Ronn McFarlane, Jody Marshall & Andrea Hoag as featured acts. 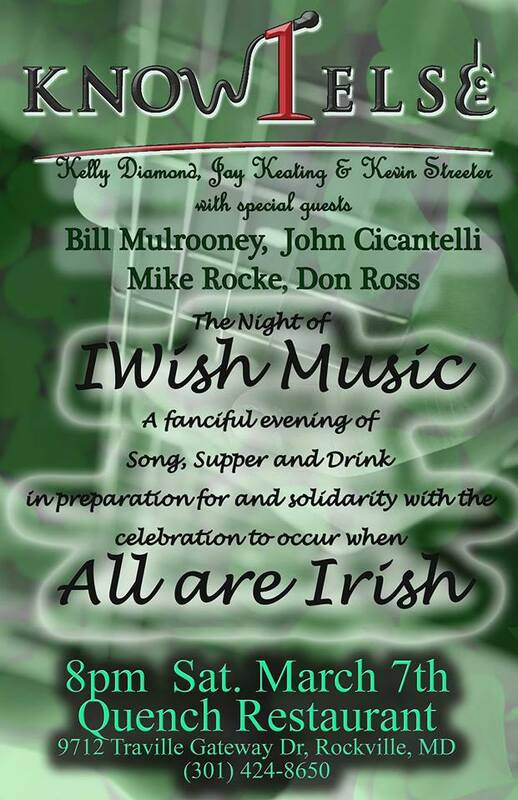 With harpish Janet Edmonds & The unvirtuous virtuoso guitar and tenor voice of local favorite, Sean McGhee. Know1Else (heard rehearsing in this video) will bring their colors as well. It is free to all and starts at 3pm and goes til 7pm at St Aidans Episcopal Church. Excited to be part of this great festival! 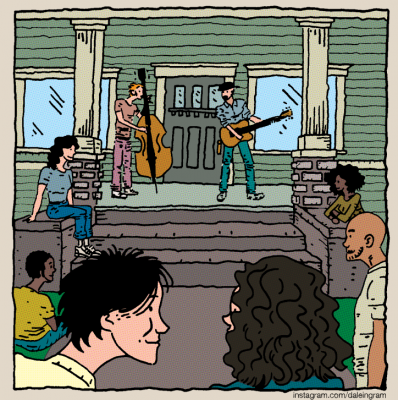 We'll be performing from 2 - 3 pm at 7005 Westmoreland Ave in Takoma Park. 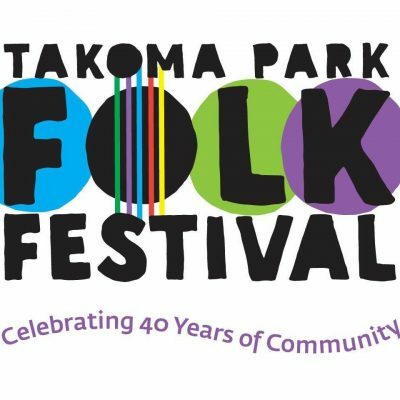 See Takoma Porch website or Facebook event page for more information, including a map and bios of all performers. StreamCatcher – Know1Else hosts notable local performers in the first of a special live streaming series, co-sponsored by SAW and Focus Music. 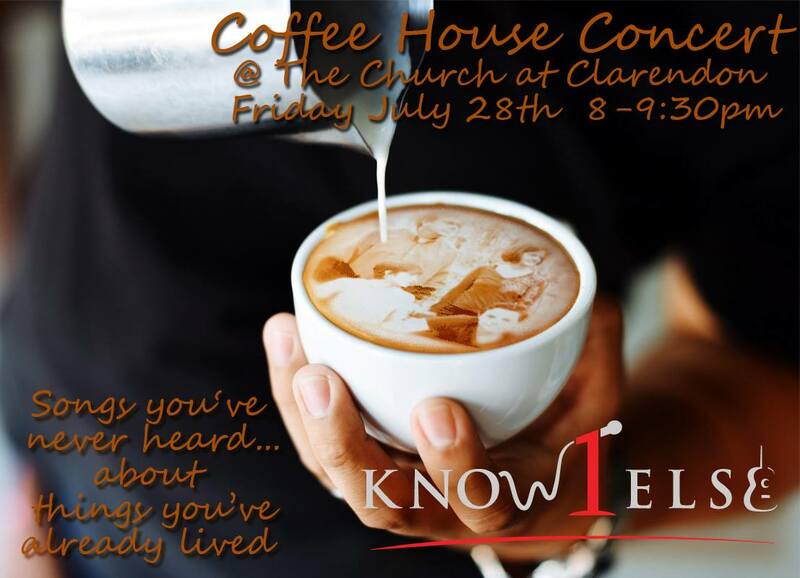 Steve Coffee, Robert Prentiss, Paige Powell, Carley Harvey, Know1Else and more. We'll be playing for Friday Night Live, a weekly event at the Church of Clarendon. 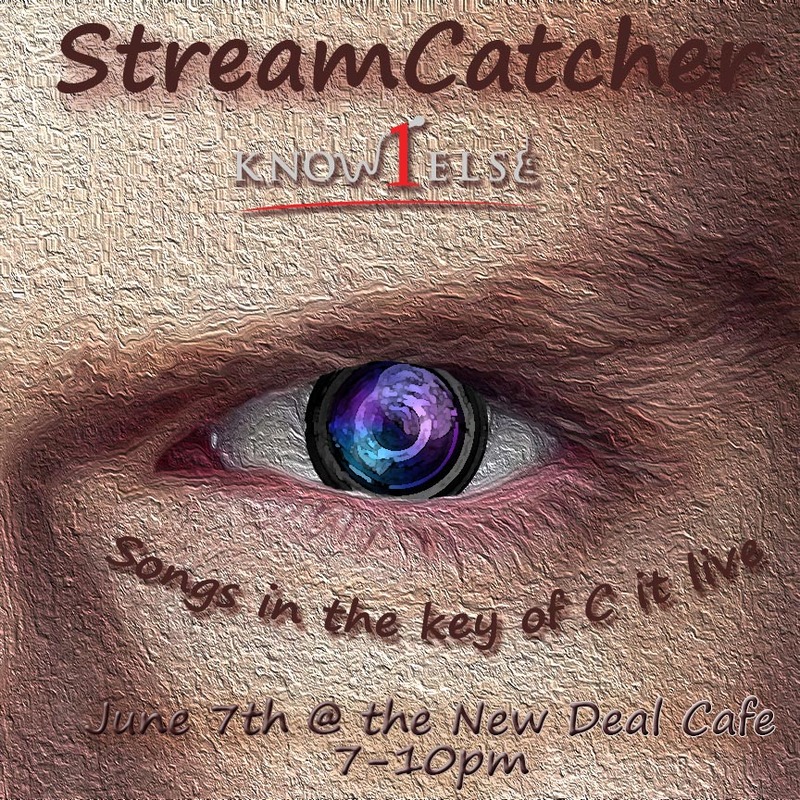 StreamCatcher – Know1Else hosts notable local performers in the first of a special live streaming series, co-sponsored by SAW and Focus Music. 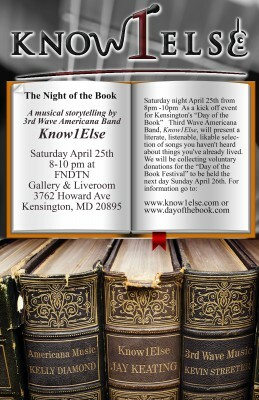 Featured performers Alexander Gallows, Paige Powell, Leon Susana, and Know1Else. We'll be playing on Patio at Silver in Bethesda from 5:00 to 8:00pm. 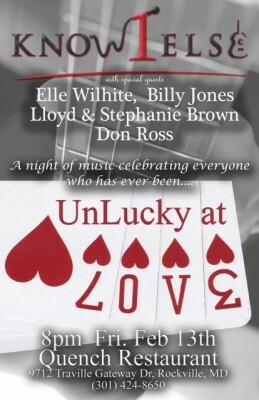 Enjoy over 30 $5 food and drink selections and live music. We'll be at the Grove Stage, starting at 1:40pm. The Takoma Park Folk Festival is a free annual festival featuring music and dance from around the world on seven stages in Takoma Park, Maryland. From old-time fiddle and bluegrass to acoustic folk-rock to Afro-Latin fusion, performers range from well-seasoned stage veterans to youngsters on stage for the first time. The festival also includes dance workshops, children's activities, a crafts show and ethnic food from around the world. We'll be playing at this coffeehouse from 8:00 to 9:30 - just blocks from the Clarendon metro. 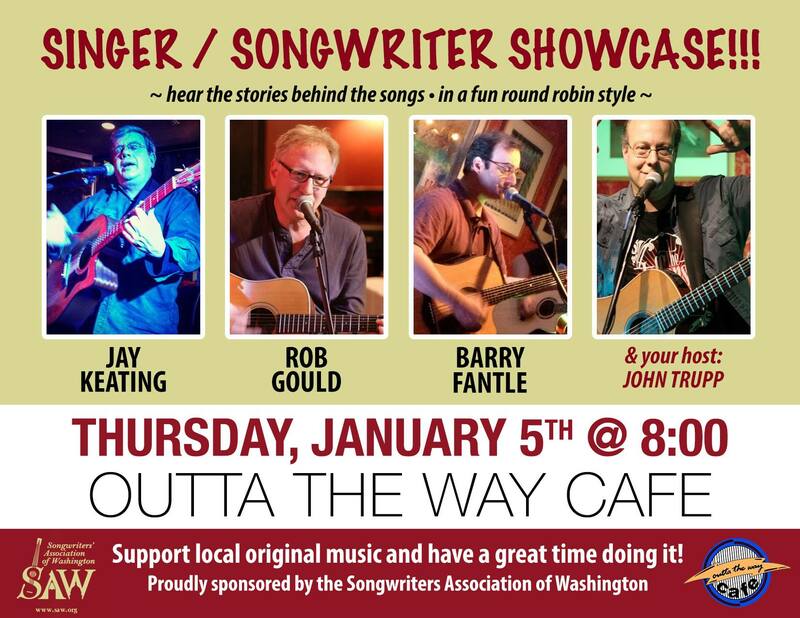 Jay Keating has showcased at The Folk Club of Reston once before. 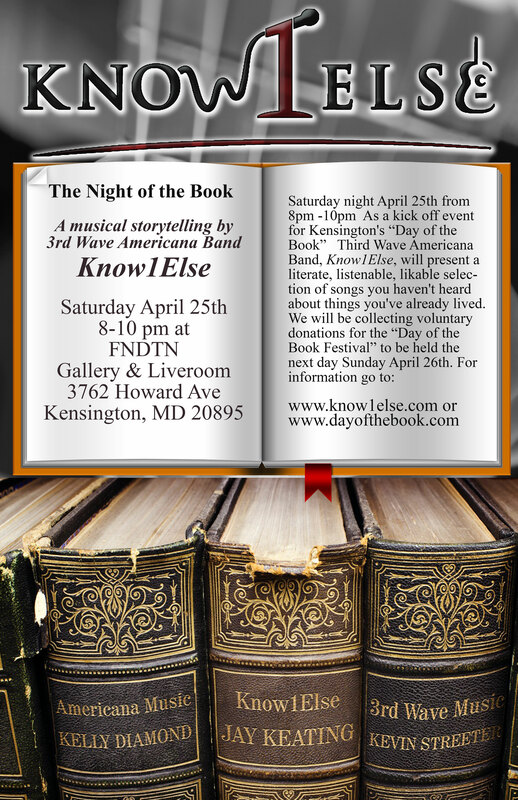 Fresh off their appearance at the Takoma Park Folk Festival, his band, Know1Else, will accompany him. They will be minus the irreplaceable, Kelly Diamond. Kelly will be in Paris that week with her husband, Jeff. (a moment of sympathy for them both...all right...that's enough) But his two bandmates and offspring, Mae and John, will be there. As will, Ron Goad, the band's percussionist and mentor. touring stand-up comedian and then a singer-songwriter in the 1980s. He opened for Jay Leno, Jesse Colin Young, Laura Nyro, Andy Kaufman, Jonathan Richman, Mort Sahl, Peter Tork (of the Monkees), and many more. He left the traveling entertainer life to be a producer of commercials and multimedia. Ever hear those wacky Don Beyer Volvo commercials over the years? That’s Jay, doing both the writing and the voicing. Kelly Diamond had never performed in her life except at church. She is a successful marketing consultant and has a wonderful family of her own. How wonderful you ask? Well, Jeff took her to Paris. 'Nuff said. sincere, sarcastic, and joyful, with a new perspective. Jay, Kelly, Mae & John are active in supporting the local music scene. Jay is now the President of SAW (the Songwriters Association of Washington) and Kelly is the communications director at SAW. Jay is on the board at Focus Music and is running a Focus showcase one Sunday a month at Positano in Bethesda. (focusmusic.org). Mae and John are often volunteers at these and other events as well as participating in numerous chorus, musicals and other pursuits. does make life more fun and surprising." It’s the most won-derwood time of the year! 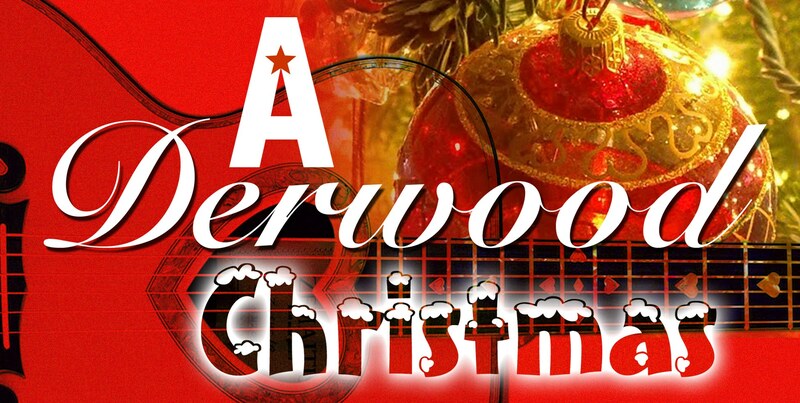 A Derwood Christmas 6 is almost here! 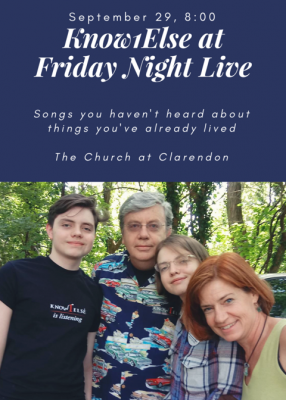 A festive event of cheer featuring splendid songs and harmonies from local musicians, young and old, you know and love (and a few you will soon). Please bring a toy to donate and bring a smile to our needy county kids. We filled lots and lots of giant boxes full of toys last year for A Wider Circle. We made so many local kids happy -- so let's do it even bigger this time! "A Derwood Christmas" is a family friendly thing so feel free to bring the whole family. 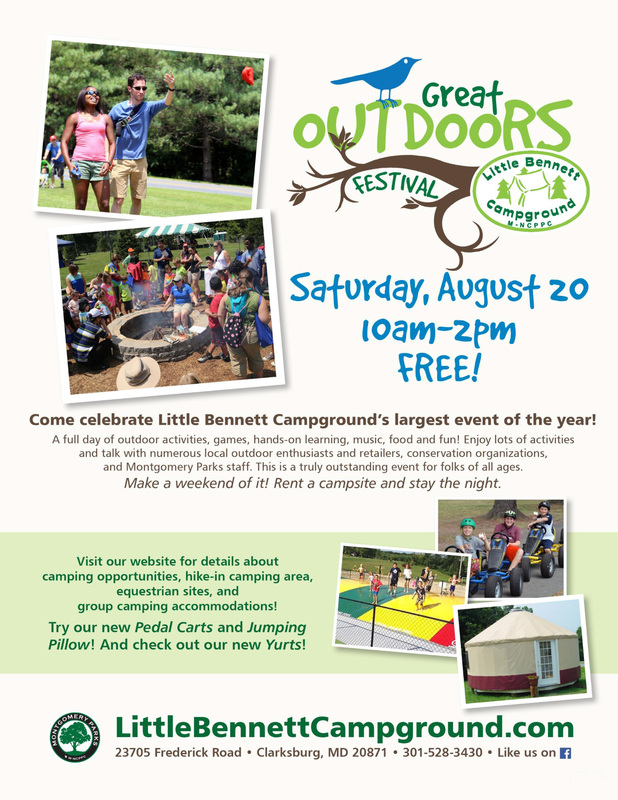 Spread some cheer and please spread the good word on this great community event. 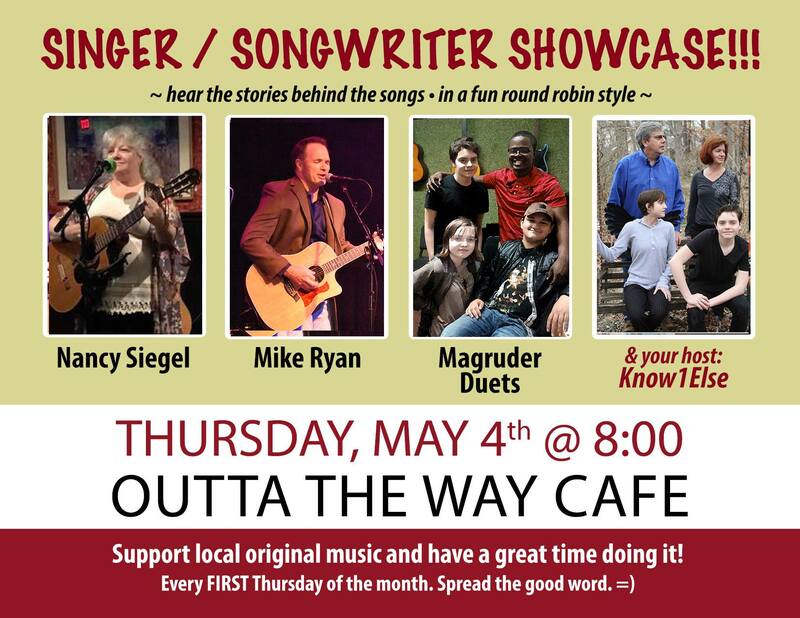 The very good folks at Outta the Way Cafe have been hosting numerous excellent benefit concerts and here is yet another fine affair not to be missed. It's gonna be a blast!